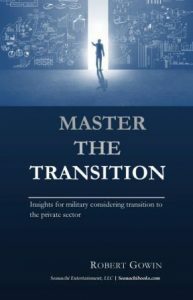 In this powerful and straightforward collection, Robert Gowin shares information on how the skills, knowledge, and experiences you've gained from the military can transfer to the private sector. He understands the challenges military face when transitioning and will provide information on how to overcome them when armed with the right knowledge. Robert's approach is to provide you with the tools you'll need to achieve success through his own personal experience as a former Army career counselor and successful hiring manager and executive following his own separation from the military. His counsel has helped many achieve their success. Available at Amazon, Barnes and Noble, at iTunes, and other locations.